A few years ago, we did a torture test on one of our rifle models: the DTI Extreme Duty AR-15. There is probably a better term than torture test, because the tests we did were designed to mimic "real-world" circumstances that may happen to the weapon. At any time, if we wanted to break or disable the weapon we could have (or any weapon from any manufacturer for that matter). That rifle functioned without any issues and is still going strong. This time we will do a quality test on a randomly selected weapon from one of our most popular lines of AR-15 rifles. Two factors gave me a desire to test a rifle from our DT Sport line of AR-15 rifles. First, they are our most popular rifle in terms of consumer demand. Pricepoint definitely is part of their popularity, but if there is substandard quality in the rifle, demand/popularity is not going to last very long. The second reason has to do with that quality. The DT Sport rifles have features like a commercial buffer tube (not mil-spec), standard (not M4) feed ramps in the upper and barrel extension, a standard A2 (not f-marked) front sight base, and a 4140 (not 4150 mil-spec) chrome moly barrel. They share these features with a number of other AR-15 rifles from other popular manufacturers. The rifle tested in this blog post is actually a DT Sport Lite, so it also is without ejection port cover, forward assist, and brass deflector. So, popularity/demand and certain features/components of this rifle (that some individuals may consider less than perfect at best and substandard at worst) combined to drive me to purposefully treat a DT Sport Lite rifle in a manner which is not suggested or encouraged, will definitely void the lifetime warranty, and may cause personal injury or worse (WARNING: do not perform any of the described or illustrated actions portrayed in this test). For purposes of integrity in this test, the DT Sport Lite tested was not preselected when built and inspected; it was purchased from a local gun store. Day 1: I took the rifle home and installed a Samson flip up rear sight (the back up iron sight we include on many of our more expensive rifles). This sight doesn't have elevation adjustments, but the distance on my short "range" at home happens to be exactly 36 yards, so it is perfect for a basic USMC style sight-in, and elevation adjustments would be made with the front sight. 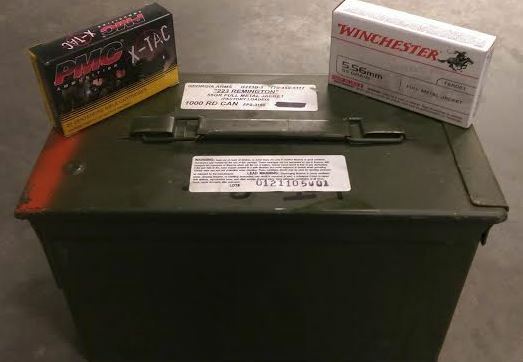 I fired a total of 8 rounds of Winchester 5.56X45 NATO 55 grain FMJ ammo in 2-4 round groups. Each 4 round group was fired in less than 30 seconds from a seated position with the rifle resting on a railing. The first group is slightly under the standard 4cm, the second group is just slightly over the 4cm standard. I would have loved to see things a little bit tighter and could probably have achieved better accuracy, but I really wanted to move on to other areas of testing. Day 2: I took it out to the parking lot and began to do some drop/impact testing. The rifle was dropped 101 times. Sometimes, I just let it fall from resting on its buttstock; sometimes there was more than a gentle toss. I dropped it over 20 times from about waist level on the commercial buffer tube, and slid it about 10 times a few yards. My intent in doing both of these actions was to focus in on the "weaker" commercial buffer tube, and to see if impact-type abuse would cause any damage to components that project from the rifle (the bolt catch, charging handle latch, front sight base). There was no damage to the buffer tube or stock (other than serious scuff marks on the plastic stock components). The charging handle was bent down near the latch at about a 45 degree angle, but was still operational in doing what a charging handle does. I did take it home that evening and hammer it back as best I could so the latch would actually catch and release when used. The plastic grip and handguards were also scuffed. The impacts from drops and slides also caused scratches through the anodizing on the delta ring and lower (near the magazine well). The flash hider and top of the front sight base also had heavy abrasions. The video shows the last couple of drops/slides. No damage was experienced that caused malfunctions; the damage was purely cosmetic. The weapon got dirty. Crazy filthy dirty. Every fiber of my being wanted to stop and clean it simply because that is what I was taught to do and that is how a rifle should be treated. If you shoot it, you clean it...if you aren't doing anything, you are cleaning weapons. Heavy carbon fouling was in the barrel extension area, in the upper receiver, and had created "mountainous terrain" on the tail of the bolt. Most rounds were fired in a double tap type of mode out of 30 round magazines, but enough mag dumps were performed to permanently change the color of the gas tube in the first hour. Day 4: The following evening, I took the rifle home and test fired it again to see if the impact tests or 1000 round test would alter the pre-test accuracy. I fired one group of five rounds with the same ammunition and under the same circumstances (Winchester 5.56X45 NATO 55 grain FMJ ammo, all 5 rounds fired from rested/seated position, in less than 30 seconds). The group opened up considerably, almost double. It was time to clean the weapon and see if that changed anything. I spent a few hours cleaning the barrel, and all night soaks were necessary for the bolt parts. I thought I had the bore of the barrel pretty clean using my standard strong stuff, but the following morning I ran a couple of patches of VERY strong bore cleaner down the bore and a whole new type of fouling came out. That gun was REALLY dirty. Once I got home again, I test fired the freshly cleaned rifle under the same conditions and groups were back under 4cm. A clean gun is an accurate gun. So what do these tests prove? People drop their weapons from time to time, it happens. Usually not 101 times. The DT Sport Lite and its commercial buffer tube had no functional related problems from the impact tests. Could I have broken it? Sure, but the point of these tests is to mimic "real-world" types of abuse. The functioning/firing 1000 rounds in less than 4 hours test was to simulate the weapon getting excessively dirty from not being cleaned or someone using this gun in a class environment or prolonged defensive environment where cleaning cannot occur. The DT Sport Lite doesn't have M4 feed ramps or a forward assist to aid feeding in a dirty weapon, but it didn't need it, not once. In regard to these scenarios, it passed the tests so far. I think that is enough for "Part 1" of this test. In next month's post, we will update the round count, relay any changes in accuracy, and describe and include video of the test where we repeatedly submerged the weapon in a filthy pond then fired it, so stay tuned! There is a meaningful purpose behind the testing of this rifle. The DT Sport Lite, the DT Sport, and ALL the rifles in our product line are quality, dependable, and useful tools. We will keep putting this DT Sport Lite through rough circumstances and keep updating you with honest results. Thanks for reading our blog, if you have any questions about the rifles we manufacture or the AR-15 parts and accessories we offer at www.del-ton.com, please feel free to contact us.